In Tulsa, Oklahoma, Energy One Federal Credit Union has partnered with Credit Union Direct Lending by CUDirect (CUDL), which allows our members to purchase their new or used car at the dealership and finance that loan with Energy One while signing documents at the dealership. 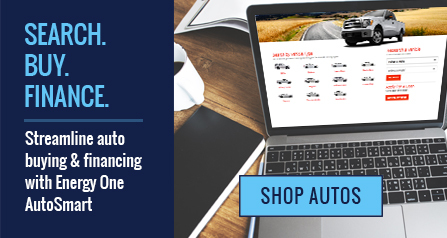 Energy One has done this to make the car buying process easier and more convenient for our members and allows them to drive away from the dealership with their financing in hand. This reference page is designed to answer any questions you have as an existing member who uses this service, or if you’re a new member who comes to Energy One from the dealership. We do not charge you for this service – As a member of Energy One, this is a benefit of your membership. Not all dealerships belong to CUDL – Not all dealerships are on the CUDL network and some dealerships aren’t eligible or may be out of the CUDL area. You can still buy your car there but we have to do your financing by traditional methods, which we are happy to do. If you have a question regarding the dealership of your choice, please call any loan officer. Your loan is underwritten the same way – There is not a difference in underwriting from a member who walks into a branch or one who walks into a dealership. We do not require the purchase of GAP or Extended Warranties – A purchase of a GAP policy or warranty does not factor into a loan approval or denial at Energy One. We can pre-approve your loan at the branch – Our loan officers can pre-approve your loan before you go to the dealership within the CUDL loan system and the dealership can reference that information. Rates are the same – Our base rates in Tulsa, OK are the same at the branch and the dealership. Payments can be made at the branch or you can auto debit from your existing account at another institution – We don’t require a specific payment method and you can auto debit from an existing account, pay in person or set up an auto payment from your account at Energy One. A new member from CUDL is a full-fledged member – If you opened your account based on a new loan done at the dealership, you’re entitled to the same membership perks as a member that came from a lobby visit or through their employer. We want you to move your loans to energy One – Whether you came to us from the dealership or you’ve been a member for 25 years, we want to have an opportunity to serve you on 100% of your loans. We offer mortgage, boat, RV, motorcycle, signature/unsecured and existing refinance loans on your current vehicle in additional to new purchases. Give us an opportunity to save you $$$. Energy One has also partnered with CUDirect to offer our AutoSMART car buying tool. You can search by dealer, zip code, distance to your home and vehicle type. Streamline finding and financing a car with AutoSMART! Explore AutoSMART to find your next car or truck today.